I can’t believe I’m writing about an American Riesling. Not because I’m a hater-I look at every wine I dislike as a missed romance- my palate is just not about syrupy, sweet wines. American Rieslings have a reputation of being sweet and thick. While “sweet” and “thick” can be very desirable adjectives for certain things in life, wine is not one of them. I checked out the new(ish) Elevated Wines & Spirits in South Mpls off Hiawatha Ave. I was welcomed by warm employees as I walked into this great space full of craft beer and wine. The New France [local distributor] rep, Erin, was pouring delicious wines. I told her I was going to make some spicy Mandarin chicken and she asked if I’d tried Kung Fu Girl Riesling. At first I balked at it, seeing it hails from Washington State. Erin told me that she’s not a Riesling drinker by nature but loved this one. So, I took her advice and off I went. Kung Fu Girl is bursting with zingy apricot, tart apple and peachy floral aromas and tastes. It’s smooth and silky with a layer of lime balanced by minerality. It’s truly an off-dry Riesling and I haven’t had an American one that mimics a German Riesling. ‘Tis the season for corned beef and cabbage, so, on a hunch, I bought another bottle. Constructing the perfect Reuben is quite important to me. The corned beef must be shredded, topped with Frank’s sauerkraut, thick swiss cheese & a healthy dollop of Thousand Island dressing. Oh, and it had better end up between marble rye. 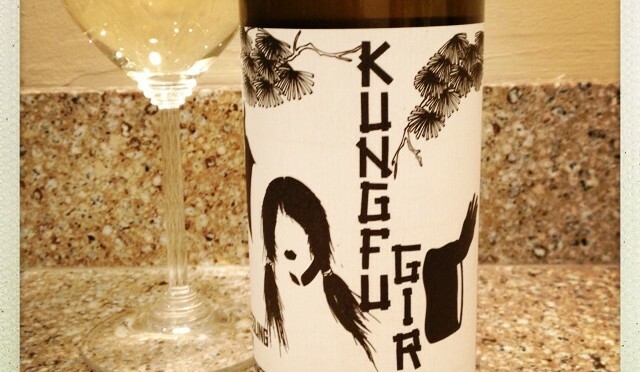 I must tell you the Kung Fu Girl Riesling was a pleasant surprise. The zing and tart, balanced by sweetness and minerality, cut through the thick beef/kraut/dressing veil- complimenting it rather than competing with it. This was wine/sandwich perfection. Get your corned beef on for St. Paddy’s Day and I defy you to go against the norm and pair it with this Riesling. Corned beef aside, this will be my go-to wine for spicy food. it paired swimmingly well with Mandarin Chicken (kissed with Sriracha). I can also see this pairing well with a burrito al pastor, possibly Pad Thai. It’s also going to be a superb Summer sipper. Erin, you vino matchmaking genius, I can’t thank you enough for persuading me to take this girl home. What’s cooler is that a local hole-in-the-wall wine shop still has some ’07 on the shelf, and all that acid has kept it fresh, and the flavours have integrated nicely. Pleasant surprise! $20 is a terrible price and no need to shop there again. It is $7.99 on the Internet. This is the problem with the Twin Cities. Too many shops think they have a right to charge top dollar for wine and they get away with it because no one wants to drive an extra 5 miles to a good wine shop. Neil is a friendly neighbor to our North. He is aware of pricing, just sometimes these items get taxed more in Canada. Thanks for the tip that it’s online for $7.99. Perhaps with tax and shipping it may still be less than the $20 price tag he’s found it for recently. I drink Riesling often and surprisingly didn’t think to enjoy it with a Reuben. If you’re in to exploring more dry [American] Rieslings….you really should check out Rieslings produced in the Finger Lakes. Most of the wineries don’t have wide distribution yet, so you have to buy online. What a great blog! Looking forward to reading more. I’m unfamiliar with NY wines other than they are emerging as stars. A local store I frequent and I are talking about exploring more NY state wines, so I appreciate the Finger Lakes suggestion more than you know! If you have any others, feel free to hit me up. There’s always something to explore in the wine world. Happy St. Paddy’s Day to you! As much as I love wine, I do love a perfect pint of Guinness!